(CNN) -- A tsunami warning was canceled Friday for Vanuatu, the Solomon Islands and New Caledonia in the Pacific Ocean when the threat from a 7.2-magnitude earthquake had passed. The Pacific Tsunami Warning Center issued the warning early Friday when the quake struck near the island of Vanuatu, saying that an earthquake of that size "has the potential to generate a destructive tsunami that can strike coastlines in the region near the epicenter within minutes to hours." There were no reports of serious damage or injuries. The earthquake was 20 kilometers (12.4 miles) deep, according to the U.S. Geological Survey. 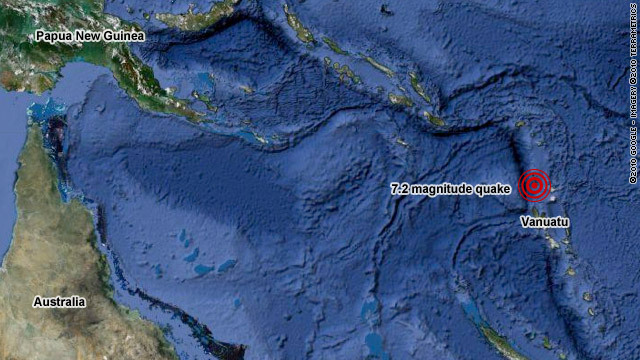 Its epicenter was 215 kilometers (135 miles) from Luganville, Vanuatu. It struck at 4:14 a.m. Friday (1:14 p.m. Thursday ET), the USGS said. The USGS initially classified the quake as a 7.6 -magnitude, but later downgraded it.